Savour chocolates and lavender scones (above) on your tour of Swan Valley. I have heard all about speed dating. But what is speed grazing? Curiosity heightens when I hear about speed grazing in Swan Valley of Australia as I arrive for a five-day tour of the region. Will it be a whirlwind tour to see cattle grazing - or gazing at speed junkies racing around a grass track? "None of that," tour guide Loris Harding assures me. She hands out red shopping bags and says: "You've got to listen, taste, buy, move on. You've got to be quick as you will be discovering what 10 outlets have to offer in 180 minutes." I get a taste of Yahava Koffee Works; Windarra Honey; Oggies Ice-Cream; Cape Lavender, which makes goodies with lavender including cakes and wine;Windy Creek Estate wine; Mondo Nougat; Morish Nuts and other gourmet outlets in the designated time - a series of taste sensations in Swan Valley. Mr Alfred Edgecombe (above) of Edgecombe Brothers winery prepares an asparagus dish. Masterclasses offering hands-on experience include cheese-making at the Cheese Barrel (above) and becoming a wine-maker for a day at Sandalford (below). I fly on Singapore Airlines to Perth. Other airlines that operate flights from Singapore to Perth include Qantas, Scoot, Tigerair and Jetstar. The flight takes about five hours. 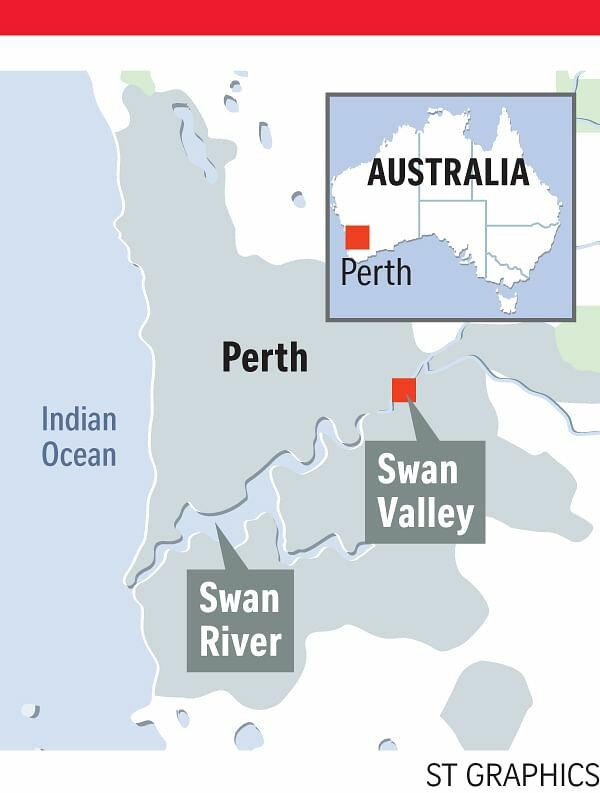 From Perth Airport, it takes about 25 minutes by car to reach Swan Valley. Mini-bus services are also available. The best way to get around Swan Valley is in a self-driven car. You may visit restaurants, cafes, wineries and retail outlets whenever you want. Mini-bus tours are available as well. By paying A$95 (S$96, child fare is A$49), visitors get a taste of what these places offer. If they want to buy any item, they get a discount of up to 20 per cent. Taste Bud Tours (www.tastebudtours.com.au) is unique, says Ms Harding, who launched speed grazing in March 2011 to showcase the award-winning food and wine trail of Swan Valley, a 25-minute drive from Perth airport. 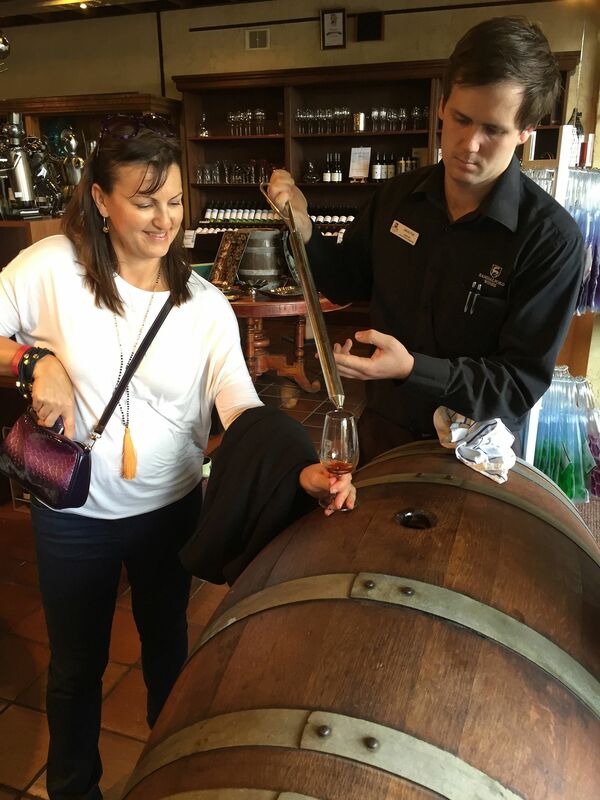 "I am an avid traveller and a dedicated foodie and I want guests to enjoy different tasting experiences at delicious locations," says Ms Harding, an enthusiastic storyteller who has led tours since 1988. Swan Valley is a beautiful region, nurtured over the years by different groups of settlers, from indigenous to colonial to those from southern Europe. Passionate people have worked hard over the years to create a frills-free settlement that today produces some of the best wines, vegetables, fruit and meat in Australia. Swan Valley suddenly appears during the quick drive from the airport. The region takes its name from the black swans which were ubiquitous here years ago. The soil - mostly deep alluvial loam - is so rich that the land was in high demand from the days of the first settlement in 1829. Many varieties of grapes thrive here. Wines are the most popular produce and the 32km wine-and-food loop is dotted with about 80 wineries with vineyards. Because there is little rain and the sun is hot,world-class varieties of chenin blanc, verdelho, shiraz, cabernet and petit verdot can flourish. The long and dry summers also allow grapes to reach their maximum ripeness, creating the ultra-high sugar levels needed to produce rare and coveted liqueurs and fortifieds. Ms Julie Church, who handles administration and marketing at the Swan Valley and Regional Winemakers Association, tells me that the warm climate is perfect for a special style of sparkling wine. "The fruit, picked early, has only moderate acidity, compared with traditional cold-area sparkling fruit," she says. "And so, Swan Valley makes lovely crisp wines that do not require the traditional liqueuring to balance them. They are bone-dry and have a remarkable lightness and freshness." In 2014, Swan Valley celebrated 180 years of wine-making. The first commercial vintage from the region was released in 1834 by Thomas Waters of Olive Farm, making it the oldest in Western Australia and second oldest in Australia after Hunter Valley. Olive Farm, established in 1829, Houghton and Sandalford are the old hands. The young upstarts include Pinelli, Talijancich and Mandoon. I visit eight wineries and learn that the wine industry here has strong Croatian and southern Italian heritage as immigrants from those parts have been settling here since the mid-1950s. The owners greet my travel companions and me at the cellar door - a common custom. They also take us on a tour of their establishment. Most have fascinating tales to tell of how they and their forebears overcame extreme hardship to set up their vineyards and initiate sales. The best man to talk about the wine industry in Swan Valley is Mr Charlie Zannino, who owns Valley Wines and was, till recently, City of Swan mayor and Swan Valley/Gidgegannup ward councillor for almost 20 years. Over a fish fillet lunch with a 2014 Classic White at Sandalford, the 65-year-old regales me with stories of how his father, Antonio, landed penniless in Australia from Italy in the mid-1950s, the family's purchase of a vineyard in Swan Valley in the early 1970s and their drive to make and sell bulk wines, a tradition that he carries on with his wife Sally and sons AJ and Trent. "Times were tough," he says. "Now, things are much smoother, but there is always the challenge of keeping out developers and fast food outlets that want to buy into the region. "The younger generation, too, consider wine-making a painstaking process and look for other avenues for work and income." Interestingly, the wines are mostly sold in the region, with a couple of labels available at Merchants and PasarBella in Singapore. Because production is minimal, you have to travel to Swan Valley to imbibe the classy wines. The top wines take centre stage at the Singapore Airlines Swan Valley Wine Show, an annual affair that is judged by experts from Europe, Asia and Australia. The awards dinner at the swanky Maldoon Estate, which I attended on Aug 28 last year, is a grand affair involving 230 participants and guests. The highest honour, the Singapore Airlines Trophy for the Best Wine of Show, goes to Talijancich Winery (www.taliwine.com.au), noted for making fortified wine from muscat and shiraz since 1932, for its Talijancich Pedro Ximenes Liqueur 2007. Singapore Airlines serves limited quantities of these wines at its SilverKris Lounge at Perth Airport. Mr Alex Ng, the airline's manager for Western Australia, says: "Unfortunately, most wine-makers in Swan Valley operate on a boutique to medium scale and are unable to produce large quantities of their fine products for us to serve on our flights worldwide." Nevertheless, the airline still decided to support Swan Valley by taking up the naming rights for the wine show, he adds. Besides grapes, high-quality fruit and vegetables are grown in Swan Valley. I spot road stalls loaded with seasonal produce picked straight from backyard gardens - such as plump figs, melons, strawberries, asparagus and vine-ripened tomatoes. It is a reason why an ever-growing list of chefs calls Swan Valley home. Top-notch restaurants and cafes abound, with more than 100 offering everything from fine dining to pub grub to traditional high tea. Mr Manu Fillaudeu, born and trained in the Loire Valley of France, has worked in Germany, Switzerland, England and France. He runs Fillaudeau's restaurant & Cafe (www.fillaudeaus.com.au), a classic French eatery at Pinelli Estate. "It's a pleasure to cook with locally grown vegetables, which, along with great southern lamb, free-range pork and amazing Western Australian seafood such as Kalbarri crayfish, Shark Bay tiger prawns and Rottnest island scallops, allow me to prepare flavourful dishes in the French traditional style," he says. This is a region that takes its fresh produce seriously, as it was crowned the first humane food region in Australia in 2014. Thirty of the restaurants and cafes are committed to serving humanely farmed eggs, chicken and pork. These come from high-welfare farming, where hens lay their eggs in a nest and breeding pigs are not confined to stalls. A fine example of how humane food is utilised and served is seen at Taylor's Art & Coffee House (www.taylorscafe.com.au). The quirky cafe was converted from the shed-like home of the Taylor family. The free-range and organic low-mileage food is cooked by daughter Caroline, 31, and her team. The place is famous for its breakfast. I tuck into the popular A$20 Carnivore Breakky - eggs, bacon, sausage, beans, spinach and roast tomato - which can feed at least two people. The Dark Star coffee is smooth, made by eldest son Michael, 36, a noted barista. The talented Taylor family also includes mum Jude, 64, a revered lino-cut artist whose exquisite designs and textile collection are displayed in the restaurant. A local meat I want to try is crocodile. Mr Rhys Mann, chef de cuisine at Novotel Vines Resort (www.vines.com.au; room rates start at A$180 a night) where I stay, obliges. He makes crocodile-based meat balls, confit, lemon myrtle spring rolls with banana mayonnaise and cheesecake. I find the crocodile meat succulent and packed with flavour. It has a slightly more springy texture than chicken meat and a lightly fishy taste, but in a pleasant way. Swan Valley has an ever-growing list of masterclasses, offering hands-on experience, including asparagus picking at Edgecombe Brothers (www.edgecombebrothers.com.au), cheese-making at the Cheese Barrel (www.thecheesebarrel.com.au), becoming a winemaker for a day at Sandalford (www.sandalford.com), matching chocolate with wine at Providore (www.providore.com.au), touring with the brewer at Feral Brewery (www.feralbrewing.com.au) and a bushtucker talk and tasting at Maalinup Aboriginal Gallery (www.maalinup.com.au). I relish the asparagus-picking masterclass. I am a long-time fan of the crunchy green asparagus spear, but have never fully appreciated its paddock-to-plate journey. Mr Alfred Edgecombe, a lively character, teaches me how to cut, with a sharp knife, a fresh spear straight from the plant. It is a cool experience walking through the rows and slicing off spears as equal in size as I can. Then, I carry my bounty to an outdoor kitchen. Mr Edgecombe sets up a large pot of boiling water and blanches the spears for a few minutes, before popping them into a frying pan with a generous splash of chilli- infused olive oil and a sprinkle of cracked pepper and rock salt. He loads up plates with a mountain of spears and I sprinkle on shaved parmesan cheese and lime. I savour Swan Valley's splendours over five days - enjoying the scenery and classy cuisine. I will also remember the gorgeous vineyards and wide selection of fine wine and liquor. • The writer's trip was sponsored by Tourism Western Australia and Singapore Airlines.